Currents depicts two species of butterflyfish. In the foreground, a group of Raccoon butterflyfish passes from left to right. In the background, a large school of Pennantfish moves in the opposite direction. 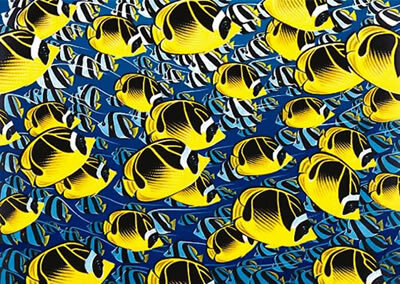 In all, the painting represents more than 180 fish in part or in whole.